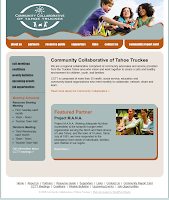 The Community Collaborative of Tahoe Truckee has a new Web site, featuring non profit and community resources. The site, www.communitycollaborative.org, offers links and information on everything from child education and development, to alcohol abuse and domestic violence. “The Web site will be a great hub for those interested in joining us and for those in need of services,” said Alison Schwedner, director of the Community Collaborative of Tahoe Truckee. The Community Collaborative of Tahoe Truckee is an organization comprised of 35 health, social service, education and community-based organizations who meet monthly to collaborate, network, share and learn. The CCTT partnership works together to address fundamental needs of families in the Tahoe Truckee region. To learn more about Community Collaborative of Tahoe Truckee, visit www.communitycollaborative.org or call (530) 587-1776. Thank you for sharing with good, useful, helpful survey. If you are looking for cheap insurance quotes, it necessary to know that when you get cheapest homeowners insurance, you save much more on rates from home insurers.